My love affair with Yotam Ottolenghi continues even though Yotam doesn’t know I exist. I fell in love with him while living in London in 2009 and fall more deeply each time I try one of his recipes. 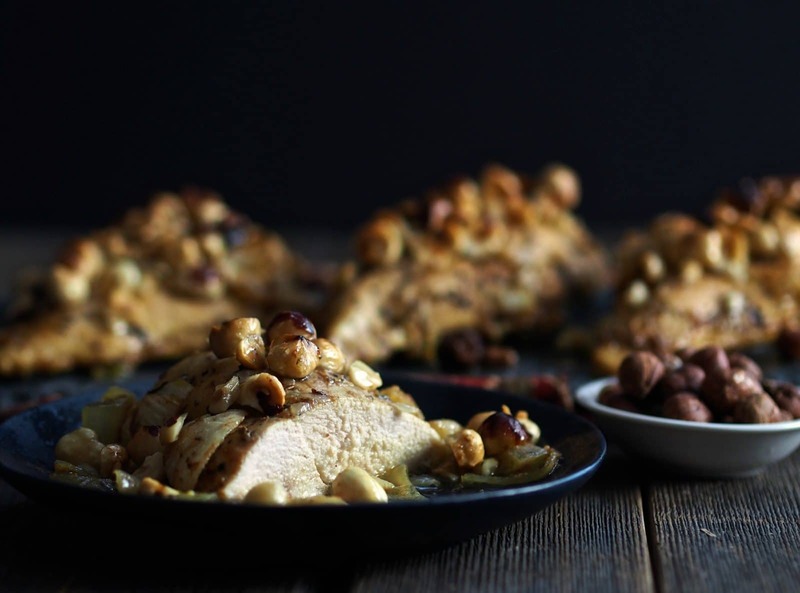 I guess I should clarify that my love for Ottolenghi is based solely on his recipes, and Roast Chicken with Saffron, Hazelnuts & Honey is one of the best. Here is his description of this dish found in Ottolenghi: The Cookbook by Yotam Ottolenghi & Sami Tamimi. Each Ottolenghi recipe I have tried has been excellent. His use of herbs and spices and his mastery of bringing together ingredients is nothing short of inspired. In 2009, when I discovered this recipe, I was a good cook but had a fairly elementary knowledge of spices. As I was reading the cookbook, I came across a photo of Roast Chicken with Saffron, Hazelnuts & Honey that caught my eye. This chicken recipe was unlike any chicken dish I had ever eaten. The list of ingredients included onions, cinnamon, lemon, ginger, saffron threads, black pepper, hazelnuts, rose water, and a few others. It sounded so interesting, unusual and delicious. After reading the recipe, I wanted to make it myself, but first had to figure out a few things. I had no idea what saffron threads were, had never touched a hazelnut to my lips and thought rose water was used solely behind the ears. At the time, we lived in South Kensington in London and only a couple of miles from a spice shop I discovered in Portobello Market. I took out on foot in search of answers to my questions about these ingredients. A short time later, I left the store with all questions answered and a bag full of the needed ingredients. 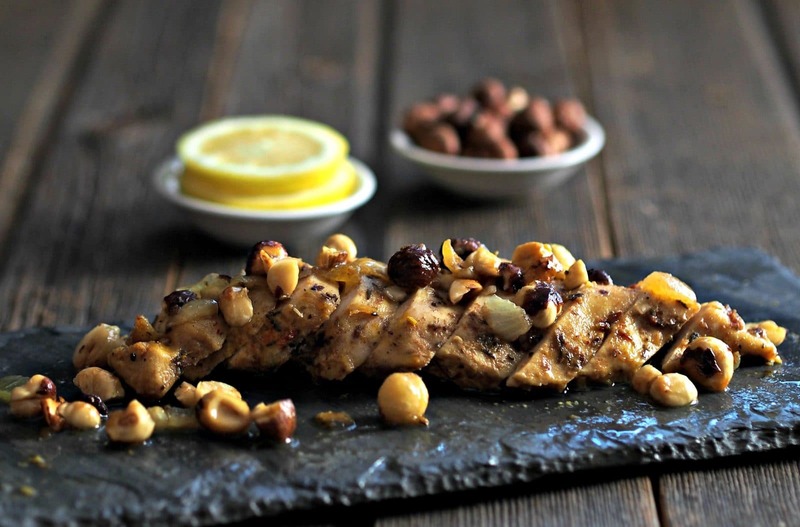 The most important thing I can say about Roast Chicken with Saffron, Hazelnuts & Honey (or London Chicken as we now call it) is this – it opened my life to a world of new flavors. Now, when I see an ingredient I know nothing about, I research it and ask more about it when I visit my favorite spice shop. I still have so much to learn, but now have an arsenal of spices and dried herbs on hand to use while cooking. I also began an herb garden a couple of years ago and expand it each year. It is so wonderfully rewarding using fresh herbs from my own garden. I have experienced how the exotic combination of flavors took simple chicken to a dish worthy of the most elegant dinner party, a dish that has everyone trying to figure out exactly what is in the recipe and a dish that will quickly become a family favorite. This is the dish that takes me back to my days in London. This is the dish that sends me to Marrakesh with one bite. This is the dish that still fuels my love affair with Yotam Ottolenghi. A few of my other Ottolenghi-inspired recipes are Pomegranate-Pear Upside Cake, Sweet Potato & Honey Goat Cheese Pizza, Pumpkin Pie Cheesecake and Caramel Macadamia Cheesecake (the best cheesecake on the planet). Place chicken pieces, onions, olive oil, ginger, cinnamon, saffron, lemon juice, water, salt and pepper in a large Ziploc bag. Refrigerate at least one hour or overnight. 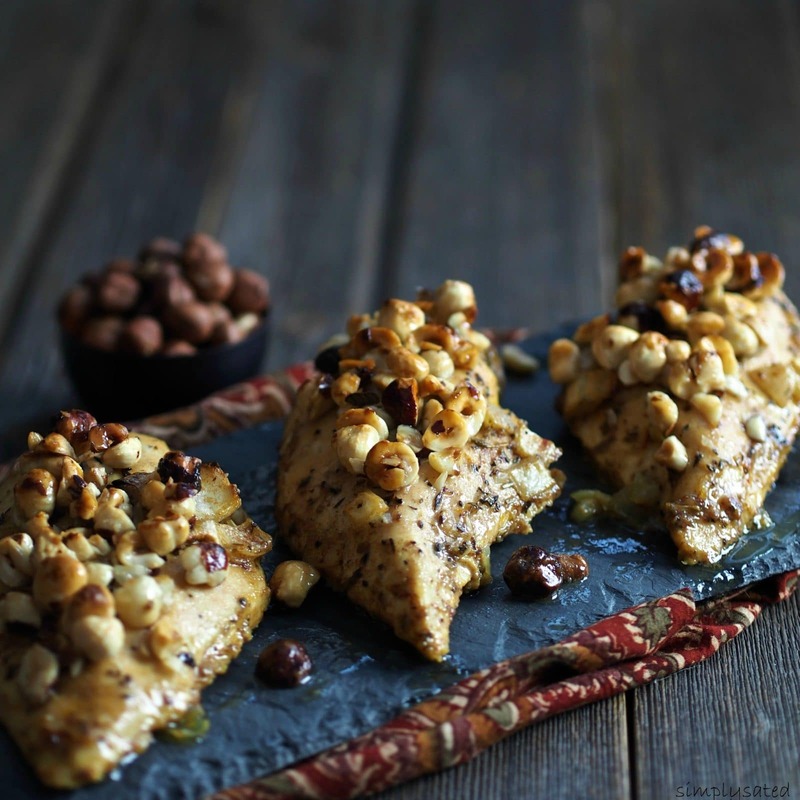 Spread hazelnuts on a baking sheet and toast for 10 minutes or until lightly browned and fragrant. Once cooled to touch, rub the nuts together between your hands to remove skins. (The nuts can be used with skins on, if desired.) Chop coarsely and set aside. Transfer chicken along with the marinade to a baking sheet large enough not to crowd the chicken. If skin is still on the chicken, place it skin side up. Roast chicken for 35 minutes. 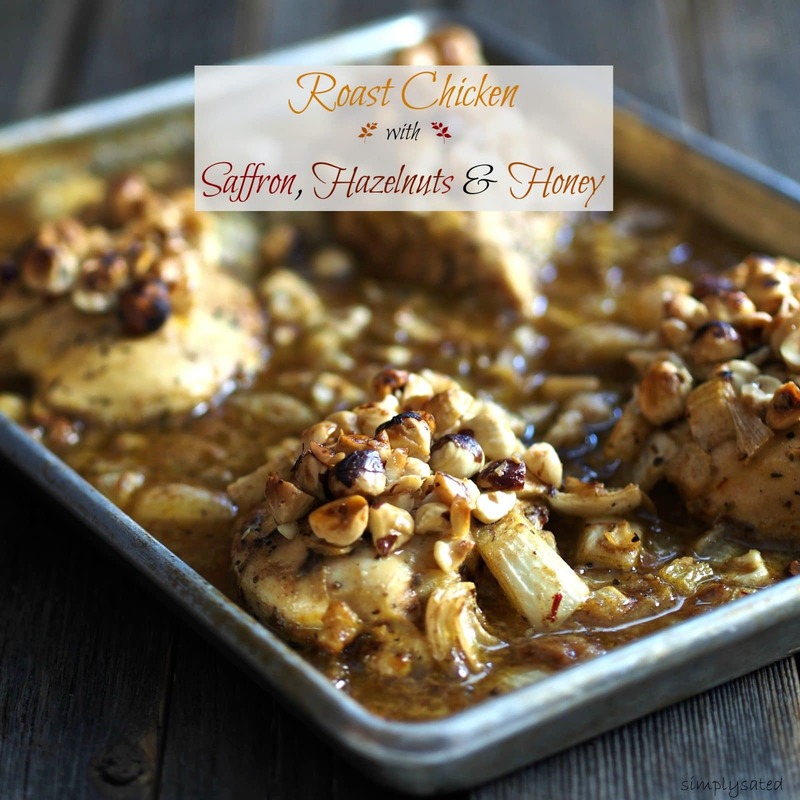 While chicken is roasting, combine honey, rose water (if using) and nuts. Remove chicken from oven and spread ¼ cup of nut mixture onto each breast. 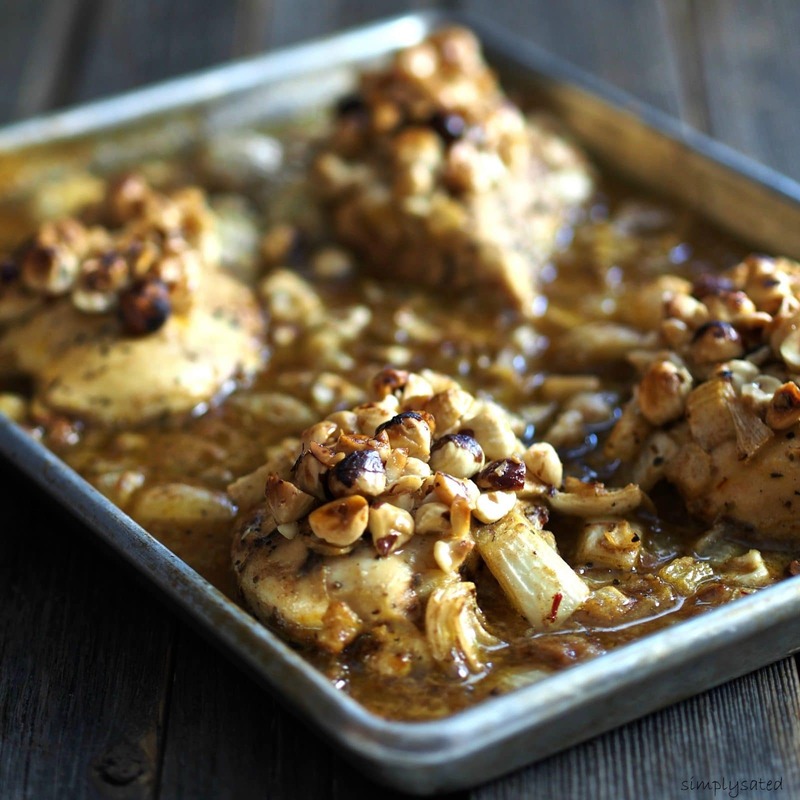 Return chicken to the oven for 5-10 more minutes or until chicken is cooked through and nuts are golden brown. Transfer chicken to a serving dish and spoon remaining juices, nuts and onions over each breast. I have made this dish with and without the rose water. I prefer it without, but others prefer it with. Either way, it is still an incredible chicken dish. YUM! This looks incredible. Why didn't you make this while you were here!!!! Ha-Ha! No time:-) I do need to make it next time you are home. What an exotic and unique flavor profile, featuring one of my favorite foods! Thanks so much for sharing this roast chicken recipe, makes me feel like I've just taken a gastronomic journey to another land. Great job!! Oh Dan - I wish you could write my posts. You have a writer's heart and talent. Thanks so much for your sweet comments. Totally love the flavors in this dish. I am loving this exotic flavour combination. The chicken looks delicious! Thank you Cindy and thanks for stopping by today. Being British I'm loving the name 'London chicken' and I'm also loving this dish. What a tasty combination of flavors. I do LOVE this dish. When this is cooking in the oven, the house fills with an incredible aroma - the aroma that flashes me back to our flat in London. Those four months in London were some of the best of my life. 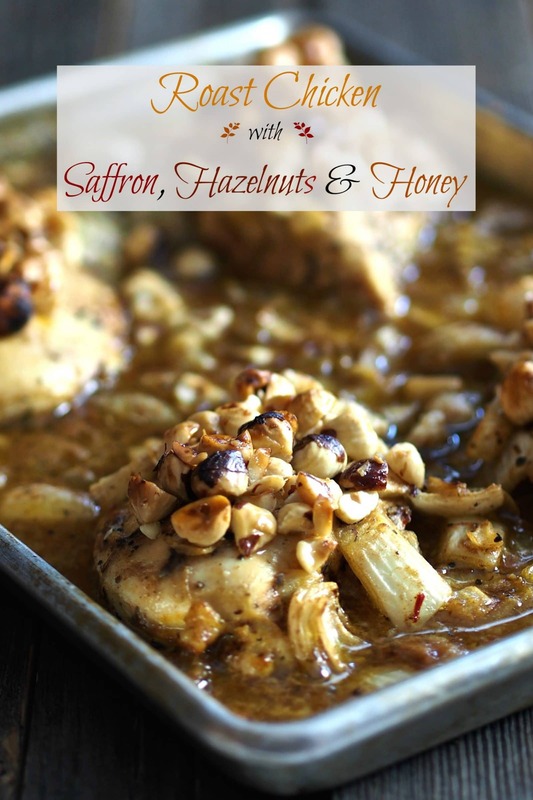 saffron, hazelnuts, roast chicken...yum! Pinned and tweeted. Thank you so much Nisa and thanks for coming by today. WOW! Does this look insanely delicious or what? Such a great flavor combination! I wish I had a "scratch" sticker so everyone can smell how great this dish smells. It is fabulous and really very easy. It always gets rave reviews. Sooooo good:-) Thanks for coming by today, Melanie, and thank you for such nice comments. I have always wanted to work with saffron (probably because it is the world's most expensive spice!) Your chicken looks incredible and the photos are beautiful. Thank you Kacey. Yes, I was shocked when told how much Saffron costs, therefore I use it sparingly. This dish would be a fabulous dish for your first try with saffron - it was mine and I highly recommend it. It is fantastic!! Thanks for stopping by today and thank you for your sweet comments. Wow!! This sounds absolutely amazing! What a fantastically creative dish! Thank you so much Nicole and thanks for stopping by. I have to say, it does taste as great as it sounds. That really is elegant! Love your topping with all those spices too! 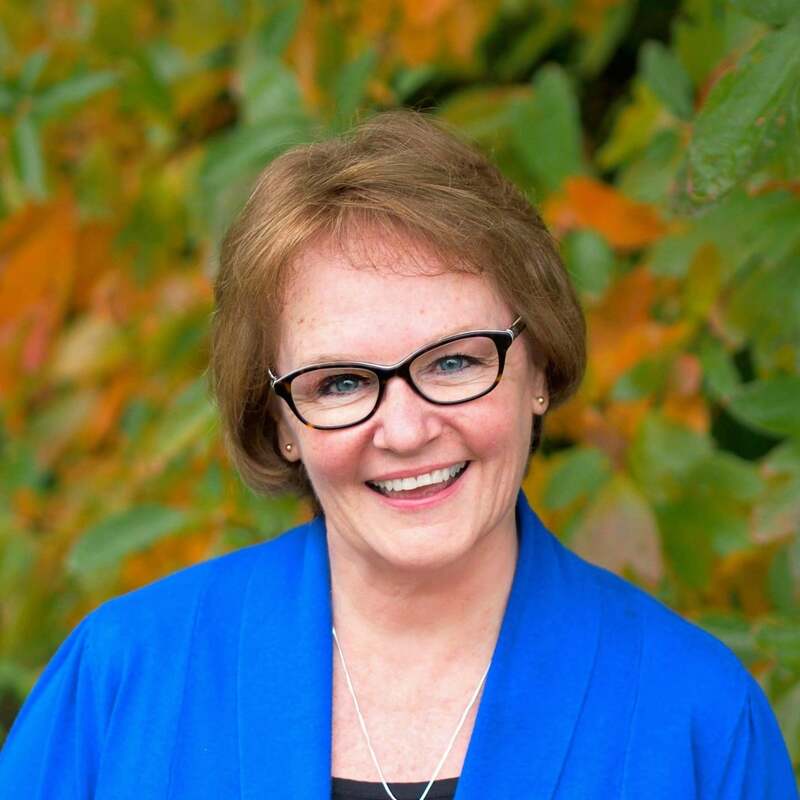 Thank you, Ginny. I really appreciate you stopping by today. What a wonderfully creative and beautiful looking chicken dish! I am loving the hazelnuts on top there! YUMMM!!!! I concur, Ottolenghi is amazing and his food is always so inspired. This dish sounds so luxurious, I love the flavors and textures! Wow! Now that is a gorgeous looking roast chicken! Pinning for later. 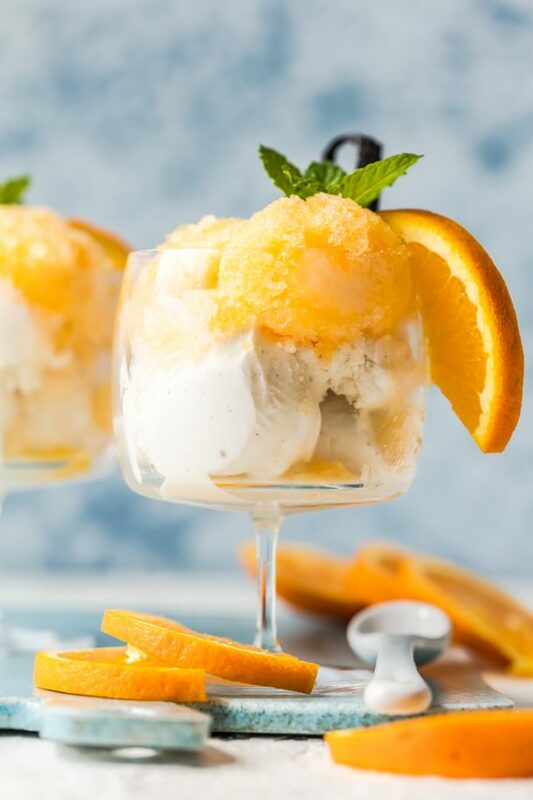 This looks delicious, and what beautiful photos! Such a great flavor combination. Must give this recipe a try! Wow this not only sounds amazing, it looks amazing as well! I would love to try this these flavors soon. Thanks for the inspiration!